The Old Globe is proud to participate in the National Jewish Theater Foundation – Holocaust Theater International Initiative – Remembrance Readings 2017 in Honor of Elie Wiesel. The Globe will present a reading of Anda’s Love by Joshua Sobol, directed by the Globe’s Erna Finci Viterbi Artistic Director Barry Edelstein, featuring Globe favorites Tovah Feldshuh (Golda’s Balcony) and Natacha Roi (The Winter’s Tale), with Talley Beth Gale (M.F.A. student in The Old Globe and University of San Diego Shiley Graduate Theatre Program) reading stage directions. Translated from the Hebrew by Roland Rees and Sobol, adapted for American audiences by Edelstein, the reading will take place on Monday, April 24 at 7:00 p.m. on the Donald and Darlene Shiley Stage in the Old Globe Theatre, part of the Conrad Prebys Theatre Center. Tickets are currently available for subscribers and donors and go on sale to the general public on Tuesday, April 11 at 12:00 noon. Tickets are $15.00 for the general public and $10.00 for subscribers, donors, students, and groups. Tickets can be purchased online at www.TheOldGlobe.org, by phone at (619) 23-GLOBE, or by visiting the Box Office at 1363 Old Globe Way in Balboa Park. From Israel’s most prominent living playwright comes the first English-language reading of a moving drama about the ongoing legacy of the Holocaust. 2002: As violence continues to shatter lives in Israel and the Occupied Territories, Petra, a German war correspondent still reeling from a recent tragedy, visits Anda in her Tel Aviv flat. The two strangers talk into the night over coffee and cognac and discover a surprising and deep bond between them, dating back to World War II. National Jewish Theater Foundation – Holocaust Theater International Initiative at University of Miami Miller Center Remembrance Readings is composed of simultaneous events drawing upon the power of theatre to honor Holocaust victims and survivors. This effort will stimulate an appreciation of how the art of theatre can and must be used as a tool to deepen the understanding of the Holocaust and its lessons in contemporary society. Playwright Joshua Sobol. Photo courtesy of The Old Globe. Joshua Sobol (Playwright) was born in Tel Aviv, Israel, and is a multiple-award-winning playwright, writer, and director whose work has been seen in theatres in Israel and abroad. His international career started in 1983 when the Haifa Theatre production of his play Weininger’s Night was invited to participate in the Edinburgh Festival. Between 1983 and 1989, Mr. Sobol wrote three related plays: Ghetto, Adam, and Underground, which constitute together The Ghetto Triptych. Its Haifa world premiere in May 1984 won the Israeli David’s Harp Award for Best Play, followed by Peter Zadek’s acclaimed German premiere that July at Freie Volksbühne Berlin, which was chosen by Theater Heute as Best Production and Best Foreign Play. Nicholas Hytner’s 1989 production at the National Theatre won Evening Standard and Critics’ Circle Theatre Awards for Best Play and was shortlisted for the Olivier Award in the same category. Ghetto has been translated into more than 20 languages and performed by leading theatres in more than 25 countries. Since 1995, Mr. Sobol has worked with director Paulus Manker on projects exploring new forms of the theatrical experience. In 1996 they created the polydrama Alma, based on the life of Alma Mahler, for Wiener Festwochen in Purkersdorf, Austria. Between 2001 and 2010, Alma was performed in Venice, Lisbon, Los Angeles, Vienna, Berlin, and Jerusalem. His many other Best Play accolades include four more David’s Harp Awards, David Pinski Award, Meskin Award, Issam Sirtawi Award, Tokyo’s Mainichi Art Prize, Yumiuri Shimbun Grand Prize, and Yoshiko Yuasa Prize. He has also been honored with the 2003 Rosenblum Award for Contribution to Israeli Theatre, 2009 Israeli Theatre Award for Life Achievement, and 2013 Golden Medal of the Land of Vienna for Meritorious Achievements. 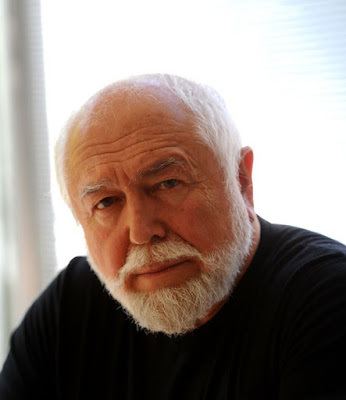 Mr. Sobol’s novel Shtika (Silence) was published in 2001 and received a Sapir Award nomination. His second novel, Whisky’s Fine, was published in 2005; the English version was published under the title Cut Throat Dog in 2010. His education includes degrees from Israel’s Oranim Academic College, Paris–Sorbonne University, Paris’s École Nationale Supérieure d’Informatique, and Israel’s Weizmann Institute of Science.